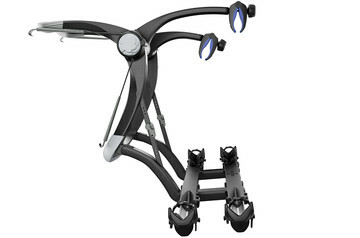 A roof-mounted bike carrier is a common carrier used to transport race bikes, but can be used with other bikes as well. The carrier is mounted on the roof, giving you full access to the trunk of your car. One carrier carries 1 bike only, but you can mount additional carriers on your roof to transport more bikes or other gear. 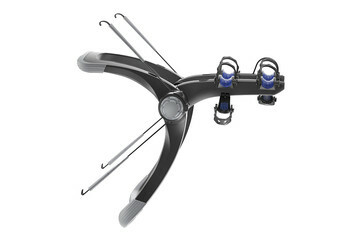 Please note that all roof-mounted bike carriers require rack or approved factory-installed crossbar systems. 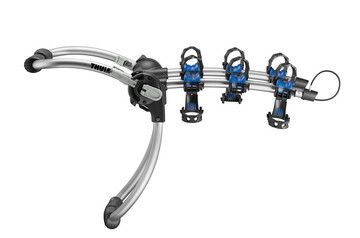 Hitch-mounted bike carriers are the most common bike carriers. 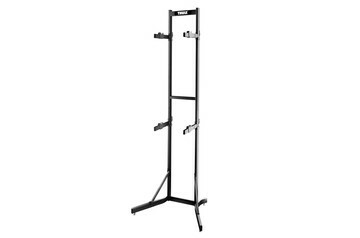 They can carry 1-5 bikes, are easy to mount to your car and limit heavy and high lifting. 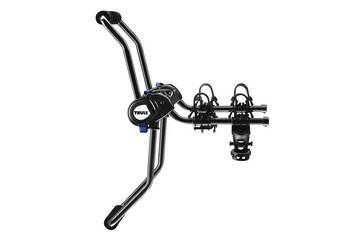 A rear door-mounted bike carrier is an ideal option if you don't have roof racks or a hitch on your car. Foldable and easy to store when not in use, the carrier is mounted on the rear door of your car and can carry 1-4 bikes. Please note that a rear door bike carrier does not fit all cars depending on the size, construction, used material and design of your car's rear door as well as on rear spoiler / windscreen wiper and other car-specific regulations. 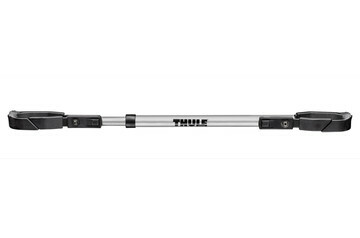 The Thule Buyer's Guide will tell if a rear door-mounted solution will work for your car. If your car has a spare tire on the rear of your car, you can mount a bike carrier directly on it. 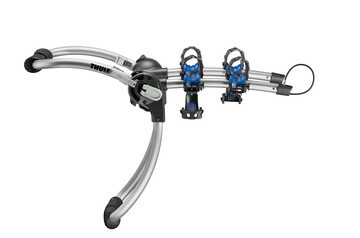 This spare tire solution is compact, easy-to-install and carries 1-2 bikes. The truck bed carriers are easy-access options for carrying your bikes in the bed of your pick-up truck. Compare the different options to match your needs. Please select your car information - make, year, model - to help us recommend the best carrier for your needs. Specify your current roof rack system from the options presented. 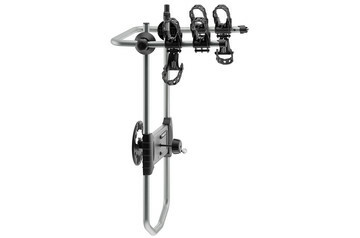 Receiver specifications impact the weight and number of bike your hitch can transport. Your bike is placed on a platform for easier loading and unloading. Your bike is hanging on the carrier arms. Tiltable / Swing-away with bikes. A tiltable or swing-away bike carrier gives you better access to the trunk of your car with or without bikes mounted. 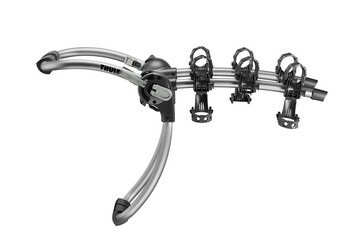 To recommend a Thule product, your car information – make, year and model – is mandatory to supply. 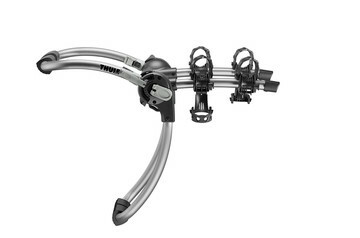 Only car variations successfully tested with a Thule carrier are available in the list. Please read fit tips carefully for restrictions on spoilers etc. 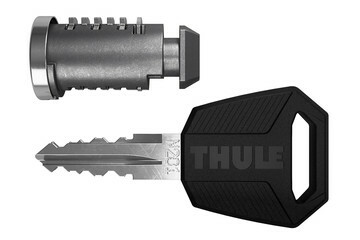 All locks for available locking options of the carrier are included. Please select your car information - make, year and model - to verify fit and help us recommend the best carrier for your needs. Where a car model has several roof variations you will need to specify the roof type of you specific car as well. Remove the front wheel and mount the bike in the fork. 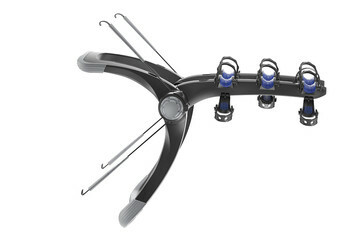 Protects the bike frame – usually used for carbon fiber bikes. Mount the bike on the front wheel. Protects the bike frame – usually used for carbon fiber bikes. Your vehicle may not support all mount location options. 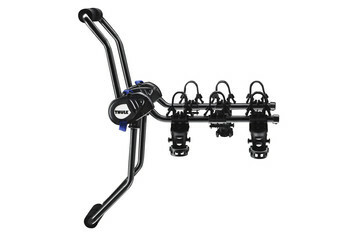 Change your mount location selection to determine if your vehicle supports other types of bike racks.